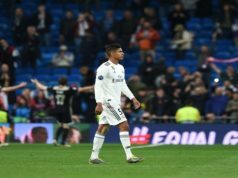 Real Madrid qualified for the last-16 round of the Champions League as they earned a difficult victory against Paris Saint-Germain thanks to a lucky goal from Nacho Fernandez. Laurent Blanc men deserved to have scored at least one goal, but Los Blancos defended pretty well and were able to hold on for all three points despite showing lots of problems in attack. The visitors exerted a high pressure on their rival from the start, and they prevented Real from controlling the possession. Yet, PSG suffered an important blow after just 15 minutes, when midfielder Marco Verratti had to leave the pitch after suffering a groin injury. Adrien Rabiot replaced the Italian. The French team had the best chances in the first half. Matuidi sent a poor effort straight at the hands of Keylor Navas when he was alone inside the box, and Ibrahimovic’s shot to the bottom corner went just wide of the post. Real also suffered a big loss as Marcelo felt pain in his thigh and had to be replaced by Nacho Fernandez. The home-grown Los Blancos defender had a big impact in the game, as he scored just after two minutes in the field. A shot from Kroos deflected off a defender and seemed to go out, but Nacho had faith and reached it. The defender seemed to have tried to send a pass towards Ronaldo but the ball ended up in the back of the net. PSG reacted after the goal and had several chances before the break. Rabiot stroke one from distance straight at the post, and Cavani failed to make contact with the ball after receiving a wonderful pass from Maxwell. Laurent Blanc men continued dominating in the first minutes of the second half, led by a superb Angel di Maria. Los Merengues could have sealed the victory in their counter-attacks. Isco had a superb chance after receiving a pass from Vazquez, but Kevin Trapp blocked his low effort. Kross also came close to scoring with ten minutes to go as he met a pass from Isco, but his shot towards the bottom corner was also denied by Trapp. 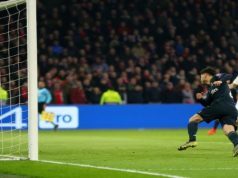 PSG could have savaged a point in the last minute, as Di Maria sent a stunning free kick towards the top corner, but his effort hit the crossbar.